As a friend of mine put it, “Do you think that in Omaha, people ask, ‘What defines a Nebraskan?’ The first and surest definition of Texans is that you spend a lot of time pondering what it means to be Texan.” You are not American — nor are you Southern, nor truly Western, nor Southwestern. And even in the parts of Texas that are distinctly one or the other (far West Texas is as Western as Arizona, south Texas is Mexico Lite), the people there will claim Texan-ness (or Tejano-ness) over all. In central Texas and the Hill Country, there’s a strong German and Czech flavor, and East Texas is spiced with Cajun and Creole flair from neighboring Louisiana. 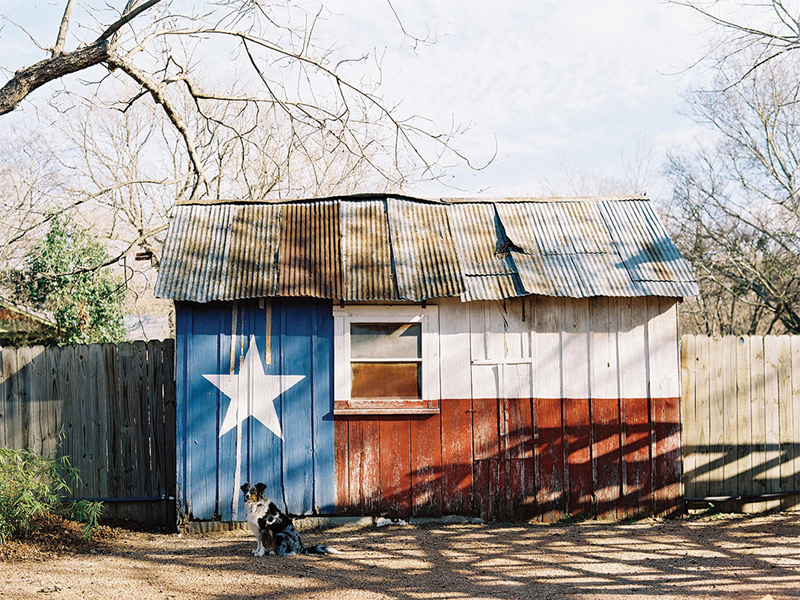 Planet Texas contains multitudes, and all of them are proudly embraced as Texan. In what other state can you authentically eat breakfast in the South (chicken and waffles and buttery grits at Houston’s soul food mainstay The Breakfast Klub), lunch in the West (slow-smoked beef brisket, ribs and sausage at Austin’s world-famous Franklin Barbecue), and top it all off with a dinner of shrimp poblano nachos and mole xiquenos under the Spanish-tiled roof of San Antonio’s La Fonda on Main? For decades before and after the Civil War, Texas was content to consider itself a member in proud standing of the former Confederacy, but about 100 years ago, leaders launched a concerted effort to rebrand the state, one that continues to this day. Public school history curricula junked tales of Stonewall Jackson’s tactical genius and Robert E. Lee’s gentlemanly derring-do, and replaced them with expositions on William Barret Travis’ defiant, suicidal stand at the Alamo alongside Jim Bowie and Davy Crockett, and Sam Houston’s stunning victory at San Jacinto. Today, Lonesome Dove ranks as something like the Iliad and the Odyssey combined for many Texans, and neither of its heroes, Rangers Gus McCrae and Woodrow Call, rallied to the Dixie flag. My own life and family history offer some insights. One of the only things my bluntly honest dad will attempt to conceal about himself is that by a cruel trick of history and much to his shame (and even mine), he was not blessed with a Texan birthplace. I’ve seen people ask him, “Which town in Texas were you born in?” and he will hem and haw, and his interviewers will press until he blurts out, “Sampson Navy Base, New York state! There was a war on!” And it’s true: His Austin-born dad was a lieutenant junior-grade swimming instructor in 1944. I console myself with the fact that my dad’s birthplace in what to us is Babylon is all Hitler’s fault. Some 52 years later, the circumstances of my own life fell such that my own son, John Henry Lomax, would have to enter the world in Nashville. While I could not deliver his mother to Texas in time for his birth, I could do the next best thing: See to it that my first-born son’s feet touched Texas earth before they ever landed on Tennessee soil. I had in my possession a vintage, Texas-fired brick, one that was stamped “Texas” on its face. I took it with me to the delivery room, and when given the black powder for his hand- and footprints, I coated the soles of my 9-pound son’s feet and pressed them to the blessed brick from the motherland. Both my English-born ex-wife and the hospital staff thought I was absolutely bananas, but 20 years later, almost all of them spent in the state where he should have been born, John Henry still proudly owns this keepsake, even though his tiny footprints are now fading. Whenever I have lived away from my native state, I have felt lost and alone. I spent the ages of 4 to 14 living in Nashville, where my dad had moved to further his career in the country music industry. I was never, ever comfortable in my Austin-born, Houston-bred skin in Music City. I always rooted for the Houston Astros, Oilers and Rockets, and the Texas Longhorns and Houston Cougars. I longed for both Houston’s fragrant magnolias and Austin’s cactus- and cedar-studded hills. Finally in 1997, I moved back to Texas, for good this time. Since then, my beloved homeland has never ceased to amaze and confound. Despite its deserved reputation as a fossil fuel state, Texas also produces more wind energy than the next three states combined. Though they’ve done their best to keep it weird, Austin is no longer as strange as it once was, but in lieu of that, the city has become a true It City, a global hub for popular music, film and technology, thanks in large part to the South By Southwest festival. Many of the other major cities have evolved in other directions. Once stuffy, buttoned-down Dallas has loosened its necktie and transformed into a city that offers ample opportunities for hedonism and even decadence, and sister city Fort Worth has added a veneer of eclecticism to its once uber-Texan, unpretentious dining and nightlife scene, much as San Antonio has expanded beyond the best Tex-Mex on the planet to many other cuisines. Houston’s Beyoncé is the reigning Queen of Pop. Like I said, Planet Texas contains multitudes, and those multitudes just grow and grow. Texans will not be content until those multitudes are the biggest and best in the land.